Erik Burns was born and raised in Baton Rouge, Louisiana where he continues to reside with his two sons. Prior to graduating from the Louisiana State University, Paul M. Hebert Law Center in 1993, Erik graduated from Catholic High School of Baton Rouge and then obtained a B.A. degree in Business Management with a minor in marketing from Southeastern Louisiana University. 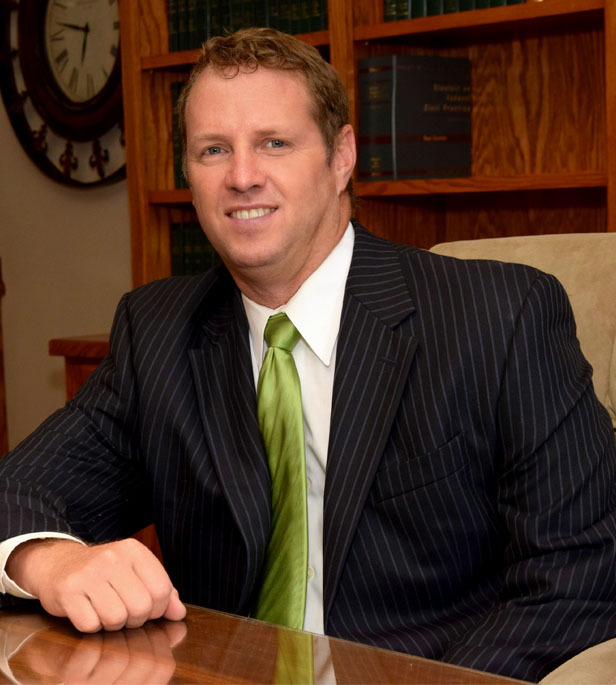 Erik began his practice in downtown Baton Rouge as a solo practitioner where he did significant personal injury work having worked closely with a seasoned attorney. In 1997 Erik was presented with an opportunity to move his office to Denham Springs, LA in a brand new building where he again worked with another seasoned attorney continuing to do significant personal injury but where his practice expanded also more significantly into the family law arena. During this time Erik also practiced in areas of criminal defense, wills and successions and general litigation. In February of 2000, Erik ventured out completely on his own and formed “Erik L. Burns, A Professional Law Corporation”. He has remained in this practice today having built an office facility he currently practices out of and moved into in March of 2005. He maintains an active practice in both Baton Rouge and the entire 21st Judicial District, which encompasses Livingston Parish, Tangipahoa Parish and St. Helena Parish. He handles personal injury cases across the state of Louisiana. Erik is admitted to practice in all Louisiana State Courts as well as the United States District Courts for the Middle, Eastern and Western Districts. Erik has been a certified family law mediator since 2007 and additionally trained in Collaborative Divorce where he also completed training in Couples Communication. This education gives Erik a unique ability to understand all facets of the emotion involved with cases involving family law and allows for a true focus on the best interest of children. Erik has had the additional opportunity to serve as the prosecutor for the Town of Walker for 9 years spanning form 1999 to 2008 and then as the Magistrate Judge for the Mayor’s court for the Town of Walker from December 2008 to March of 2012. He is a past Secretary/Treasurer, VicePresident and President for the 21st Judicial District Bar Association. Erik currently serves on the Louisiana State Bar Association’s House of Delegates having been a member since 2005. He served on the legislative committee for 3 years from 2010-2013. He presently serves on the District 5A Regional Panel pursuant to appointment by the La. State Bar Association president for the 2014-2015 term. Erik is an active member of the 21st J.D.C. Bar Association, the Baton Rouge Bar Association, including the family law section, and the Florida Parishes Inns of Court. During his time not working Erik enjoys spending time with his sons camping and fishing and enjoys tennis and reading. Erik prides himself on the fact that despite his hobbies he makes himself available to his clients virtually around the clock.